The aluminum and materials manufacturer hit new 52-week highs last month as the metal continues its surge. Shares of the world's largest producer of bauxite, alumina, and aluminum rose nearly 21% in August after the company reported strong second-quarter 2017 earnings at the end of July, and aluminum spot prices surged to levels last seen in early 2013. 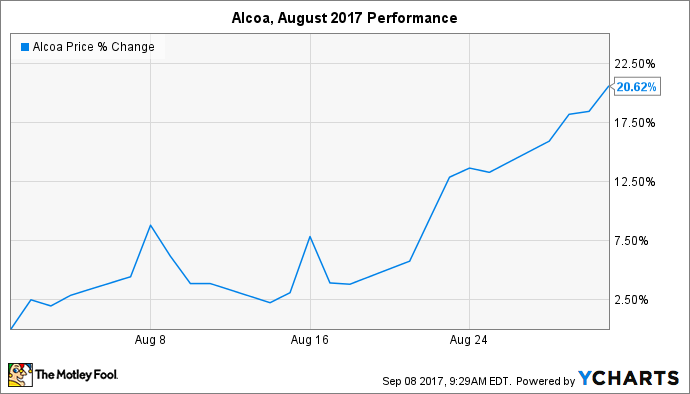 The stock move last month continues a three-month climb for Alcoa (NYSE:AA), which established new 52-week highs. The company grew revenue, EBITDA, net income, and its cash position from the year-ago period. In fact, strong operating cash flow padded the balance sheet with $152 million in new cash since the end of the first quarter of this year. The company now has over $1 billion in cash available. With president and CEO Roy Harvey expecting an even stronger second half on the heels of healthy aluminum prices, investors found plenty of reasons to keep the stock's momentum going. Aluminum prices have been on the rise for four consecutive quarters now, but they absolutely exploded in early August. Spot prices for the metal had remained relatively constant at $1,900 per metric ton (MT) for most of 2017, but they made a sharp and sudden move to $2,050 per MT in a matter of days. What happened? China. The country has been racing to shore up economic growth for the year, which is "in danger" of falling below last year's 6.7% growth clip. But several economic stimulus moves have been coupled with environmental policies. For instance, the government has focused on new infrastructure projects (increasing demand for aluminum) while simultaneously closing excess aluminum smelting capacity (decreasing supply of aluminum) by targeting the heaviest polluting facilities first. Oh, and there are a lot of dirty production facilities in the cross hairs. China is expected to close roughly 10% of its aluminum production capacity representing 6% of global supply. The timing works out beautifully for Alcoa. Fresh off hitting the reset button by spinning off Arconic, and with operational efficiency improvements finally paying off, the company is the healthiest it has been in years. Throw in higher aluminum prices -- and the potential to gain global market share -- and the future looks quite a bit rosier than it did just a few short months ago. Alcoa will continue to rise and fall with developments in the aluminum market. Investors just need to hope that management's strategy to position the company to outperform in any market continues to pay off, and that it makes the most of the good times while they last. Growing the cash balance and investing in core, high-growth, and high-value businesses will be the best way to accomplish that.